The cover to Showcase number eight featured the second appearance of the Silver Age Flash (henceforth I will eschew the use of the appellation Silver Age since for my money this is the Flash… period). It’s an Infantino/Giella cover and, if I didn’t already know who had drawn the cover, I’d have sworn it was by Gil Kane. Which, of course is why Heritage Auctions has never asked me to moonlight as one of their art experts. Still looks like Gil Kane though. This only serves to underline the fact that everyone is still working to get a handle on the character’s look (and anatomy, it sorta looks like he just broke his right leg). The thing I find most interesting about the cover is that it has absolutely nothing to do with either of the stories inside. At no point in either story does a villain or anyone else for that matter point a finger at the Flash and say that he can beat him with one finger. Kind of odd for a Julie Schwartz edited book but there you have it anyway sports fans. Moving on from the mysterious cover to nowhere, we come to The Secret of the Empty Box which follows a pretty typical pattern for the super hero stories of this era. It’s a four beat piece with beat one being the set-up, beats two and three showing the villain best the hero and beat four when the hero figures things out and captures the bad guy, with the ends being wrapped by the B story which in this case is the relationship of Barry Allen and Iris West. Bob Kanigher, the story’s writer, does a nice job using the front part of the B story to humanize Barry’s character and show off some speed tricks at the same time as he helps a young girl who has dropped her ring in a grate in the sidewalk. It’s a nice establishing bit that walks Barry right up to his meeting with Iris and the problem posed by the villain. A mysterious box has shown up in the Central City Square with apparently no way to get inside. Iris has phoned Barry to meet her there and because he helped the little girl recover her ring he predictably arrives late. He immediately deduces that that box is a ruse to distract from a crime being committed elsewhere and rushes off to find it. 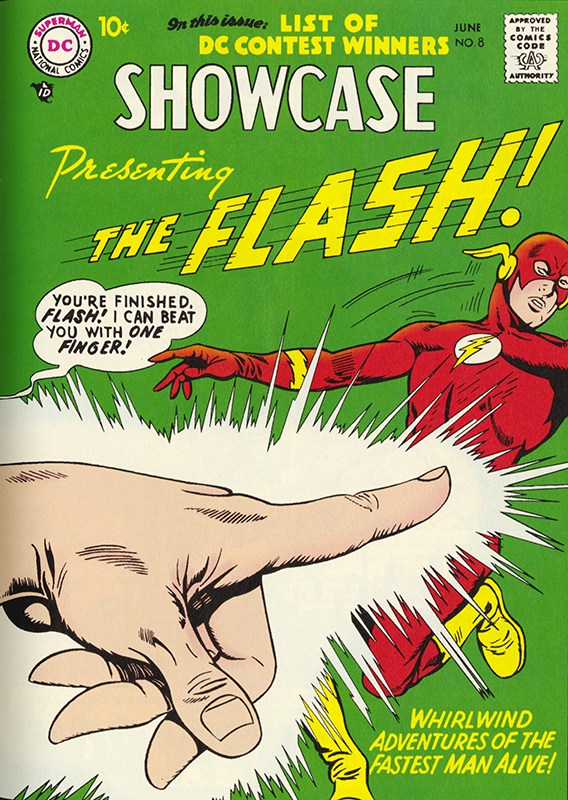 Again Kanigher demonstrates the Flash’s speed by having him change to his Flash garb in an arcade photo booth so fast that he can’t be captured in a photo. Also again proving that the Flash is faster than film. The Flash captures the villain who as we learn later is merely one of two henchmen working for the main villain. The best thing about the villains are their costumes which consist of top hats, tails and a mask, but there’s no emotional investment in the character. Actually, there’s no character in the character. We’re not given a name, a backstory or even a motive (other than greed) for the showy thefts. As a result, the character became a one-off never to be seen again. Contrast that with the villain in the second story The Coldest Man on Earth and the difference and the difference is pretty dramatic. Here we have the first appearance of Captain Cold who not only has a cool name but an equally cool Infantino designed costume and even cooler backstory. In it, Len Snart, a small time crook looks for a way to up his game by developing a weapon to defeat the Flash. Just a slight digression here… science and technology ruled the 1950s and to someone growing up in that era they were the magical answer to the world’s problems. That could also be flipped to science and technology proving the world’s undoing if used badly. So any skinny premise that involved science, even bad science, was granted plausibility by the comic book readers of the day. We, of course knew better, but if the writer involved science, sometimes just the word science, the audience would immediately buy-in for the sake of the story. Science and technology just provided a reasonable jumping off point. So when Len Snart bones up on cyclotrons, breaks into an actual cyclotron and jiggers it to turn his homemade gun into a weapon that can among other things freeze people into a block of ice, we were pretty much okay with that (my dad, other the other hand who was an engineer, didn’t think very much of the book in part because he knew way better. More on this later on down the line.) Unlike the villain in the first story whose feats go unexplained, Len Snart aka Captain Cold now has a raison d’être. The story then follows the almost catch, almost catch, finally gotcha pattern, but it’s done with a villain we can believe in and for whom we can feel something, and, most importantly, would like to see again. With this story, writer John Broome starts writing the bible for future Flash stories to follow. One thing I found interesting is that in the last two panels we find that Barry Allen has a lab partner named Stan. This is the first and last time we’ll ever see Stan, but I’ve often felt that there was a story there, narrated by Stan, just begging to be told. Maybe someday.